After months of waiting the new episodes of Sailor Moon Crystal are about to start. Act 27, which I expect will be called Infinity 1 – Premonition, airs on Japanese TV tomorrow at 11pm Japan Standard Time. Since Japan is in the future, this is 10am Eastern Time, 7am Pacific Time. It will be streamed on Crunchyroll and Hulu at some point Monday. As always just click on the Crunchyroll and Hulu links to get to the Sailor Moon Crystal page for that service to view new episodes. I expect it could be as early as 10am, but we won’t know for sure until tomorrow. Both services have free viewing options and pay options to reduce commercials. Crunchyroll is available in the US and Canada but Hulu is restricted to viewing in the United States. Viewers elsewhere who have trouble getting to either service may require a proxy service to stay up to date. Some who have already seen Act 27 have commented that it only covers half of the equivalent manga chapter, which would be a departure from what the rest of the series has done. The Infinity arc of the manga spans 11 manga chapters but is said to be 13 episodes. It’s unclear exactly how that breakdown should happen. Based on what we’ve seen and what we’ve heard from those that have seen the episode we should be seeing Haruka and Michiru however we won’t be seeing their counterparts Sailor Uranus and Neptune until the next episode. We will also not be seeing Hotaru, Kaolinite or the Witches 5 until next week, though they will feature prominently in the rest of the season. The episode should end following a quick battle with a Daimon that comes out of a student from Mugen Academy leaving quite a bit of the story of that manga chapter remaining. I’m only assuming that the episode will be titled Infinity 1 – Premonition, but since this chapter will likely span two episodes, we may be seeing a different title. I’m looking forward to finally seeing more Sailor Moon Crystal! I’ll have my review posted to the site a few days after I see the episode. This entry was posted in Pretty Guardian Sailor Moon Crystal (2014) and tagged Sailor Moon Crystal, Sailor Moon Crystal Act 27 - Infinity 1 - Premonition - First Part, Sailor Moon Crystal Phase 3 - Infinity, Sailor Neptune, Sailor Uranus by Adam. Bookmark the permalink. Can’t wait! I’ll probably be checking Hulu all day just to see if the new episode is there. Me too! I hope it;s early…I have to work! I’m so excited for this! Infinity arc has always been my favorite arc of both the manga and the original anime and Haruka and Michiru are characters very important to me and have been inspiring to me. I can’t wait to see how Crystal portrays them! I hope the animation quality will have greatly improved and I can’t wait to see the new art style in action. I also hope Infinity arc will be positively received by fans and that we’ll eventually get the rest of the manga adapted for Crystal too! Unfortunately, the French version of Crunchyroll only allows 14 days for free. Beyond 14 days, the subscriber has to pay to have an access to the shows. So it seems the permanent free version of Crunchyroll with commercial interruptions no longer exists for the French version. I’m disappointed. Sailor Moon Crystal is the only Japanese TV show I watch and though Crunchyroll is not expensive, I can’t put any money in it. I think I’m gonna create a free account and let it be blocked after 14 days. Enjoy your watching guys !!! Nice. 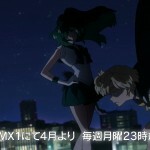 But I wonder if Rei still argues with Usagi as always? Rei doesn’t argue with Usagi. It’s amazing how many times this has been explained, yet the question is still repeated. They probably want to have each arc have an even (or in this case would the expression be odd?) number of 13 episodes to keep it running at the same time as all the other spring season anime shows. Alright guys so I’ve been thinking about this sailor moon and Pokemon cross over…just playing. On a serious note, 10:00AM ET is in nearly 1 hour, and still not sign of the new episode on either website! Got any cast suggestions for that crossover? And Sailor Moon will definitely be holding Ash Ketchum in her arms. I guarantee it. You just had to say it, didn’t you? I gave you the cast for the crossover. 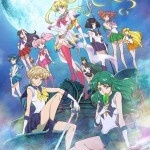 Unlike Sailor Moon Crystal with Hisako Kanemoto, Rina Sato, Ami Koshimizu, Shizuka Ito, Kenji Nojima, Misato Fukuen, Ryo Hirohashi, and Yohei Obayashi, Aya Hisakawa, Michie Tomizawa, Emi Shinohara, Rica Fukami, Toru Furuya, Kae Araki, Keiko Han, and Yasuhiro Takato will return for this Pokemon/Sailor Moon anime crossover leaving Kotono Mitsuishi as Sailor Moon. Carter Cathcart as Meowth (since Maddie Blaustein passed away in 2008). Check again at the same time the dub is uploaded. Not on yet. Thinking maybe check at the same time the dub airs. Which is 9PM Eastern Time. I’m thinking it’s just taking it’s time uploading/going active. One change that took place this morning between 9am and 10am ET on Hulu- they show there being 27 episodes of Crystal available now instead of just 26- but we just can’t see the 27th episode yet. Maybe they’re going to make it available here once the airing in Japan finishes? I can’t wait, I love the new animation. As I always have stated if Haruka was for reals she would be the only one to make me doubt my sexual preferences lol. Yeah, I guess it won’t be simultaneously streamed at the same time it comes out in Japan. Well, right now it’s 10:44AM the episode should be well over now. I’m kinda scared to go on YouTube but at the same time I want to see the allegedly new inner transformations. Don’t think the outer transform in Act 27 as they are still mysterious entities. What is this talk about the dub though? I didn’t know a dub was confirmed and I could honestly care less. I much rather watch it in Japanese with English subtitles. It is indeed on Crunchyroll. 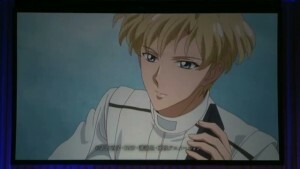 I just watched on crunchy roll…it looks AMAZING!!! The animation is so much better, no stiff movement or endless panning stills. The character designs look great also–a bit reminiscent of the first 2 seasons but definitely new and younger looking, which I like because I feel like while everyone knows their stated ages, the senshi are mostly portrayed as young adults instead of young teens/children which is what they are; it’s refreshing to see it acknowledged with the art and even their behavior in this episode. Onto the new openings and closings! They’re good, the new opening song is cute and although the it’s not instantly as infectious as Moon Pride, I can see it catching on. The Sailor Uranus and Sailor Neptune eyecatches are divine–in very similar style to all the Sailor Moon/Princess Serenity eyecatches from the first two seasons. The new transformations…the new transformations are in fact 2D and they look phenomenal. They’re not carbon copies of the original anime ones which is nice but still has similarities. They’re super dynamic and the animation is great. The disappointing part is the alleged new pens. Because there were none. I’m hoping maybe they’ll just upgrade next episode but they used the star ones with the planet power phrases. I repeat: no new pens -__- And they animated them into the actual transformation sequences so my hopes aren’t high that they will get new pens and redraw them into each of their sequences. My best guess is the fans that reported new pens either thought they looked different or maybe saw footage from another episode showing different pens. Regardless, the transformation sequences were a vast improvement. Lastly, the attack sequences. Yes, it does look like they’ve gone back to stock footage attacks but I have to say, this stock footage is badass (that’s a good thing). They’re very well animated, they’re extremely vibrant and full of motion and life–you can feel the power when you see them, if that makes sense. A+ for the new attacks. 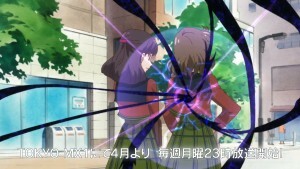 As for the mysterious new characters (Haruka and Michiru), we’re given just enough to intrigue us. And while most if not all of us probably already know that they are, this episode really makes it clear that these two are FILTHY rich. Great overall. Perfect pacing, solid animation, excellent character designs, probably more homages to the original anime than any of us were expecting, I would give this episode an A.
Omg, I just watched it. VERY good, Im not familiar with Gd or whatever new graphic design so Im not going to comment on that except I really like this new graphic/desing?? But I love how we can see more character development. It was a slow pace instead of rushing things out. I also love how they call Haruka as Him and his girlfriend. Yeah nice little details. The animation and art are much, much better though there are parts on the inner transformations that could use some touch ups, but it’s not a big deal. Omg yes! I didn’t expect that at all. Now Im going to watch it again hehehe. This new season seems so different from the previous ones… it almost looks like this is not the same series ! Toei is doing a very impressive improvement with the show and it needs to be noticed. Omg I am sooo happy! The group which released first two seasons is also releasing 3rd season in 1080p quality!!! So we European fans can watch the new episodes too! Holy sh**, I wanna see that ! I can’t afford a Crunchyroll subscription and I live in Europe too… And I’ve read in another post that you couldn’t give the name of the group, and I perfectly understand why. So I think I’ll have to do some researches by myself to find these guys… I hope it won’t take too long before I find… Anyway, thanks for the info . To all European fans who read this and do not know how to find it: just email me to moonfan@azet.sk and I will give you all information! Thank you Emily for giving your email ! That’s very kind of you . 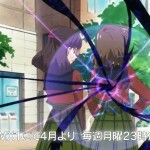 Finally, I’ve just watched the episode 27 after I found a website streaming it for free. Maybe we use the same. I’m gonna go on with this website but in case I have issues with it, I will email you, if you don’t mind. The new season is off to a great start. I like the way the new animation looks, especially in motion. There are still some minor wonky moments, but nothing terrible. The transformations are gorgeous and I love the ending song. The opening isn’t bad, but not high energy enough to be an opening theme. i agree, the animation looks a lot better in this season and the music is just as good in this one if not even better than the other ones. However having watched the first episode I have a few questions. so SPOILERS for those who havnt seen it. 2. They transferd in a busy street, clearly visable for everyone close by. Were they spotted? if no, how?! 3. 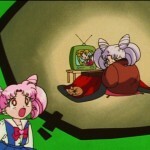 Noone in the audience (yes there is one once the monster is gone) seems surpriced to see the sailor senshi fighting, more like “oh nice, I like this part of my day, lets watch some”. So how common is it for them to be seen? 4.WHY did they revert to stockfotage attacks? In the previous seasons we could see them fighting in the surounding enviorment. Here its like in the original anime, stock fotage like combat wich is a downer to me. These are my major problems with the episode. but over all I feel like they actually begun to take us fans seriously and stepped up a lot Its a lot better animated, it feels tense and serious while still keeping a light and warm feeling. Clearly several steps up but still as I said a few questions from my part. The questions 1, 2 and 3 can’t stop haunting me, too :/ . I suppose Toei simply messed up here.